Are We All Living Sordid Lives? 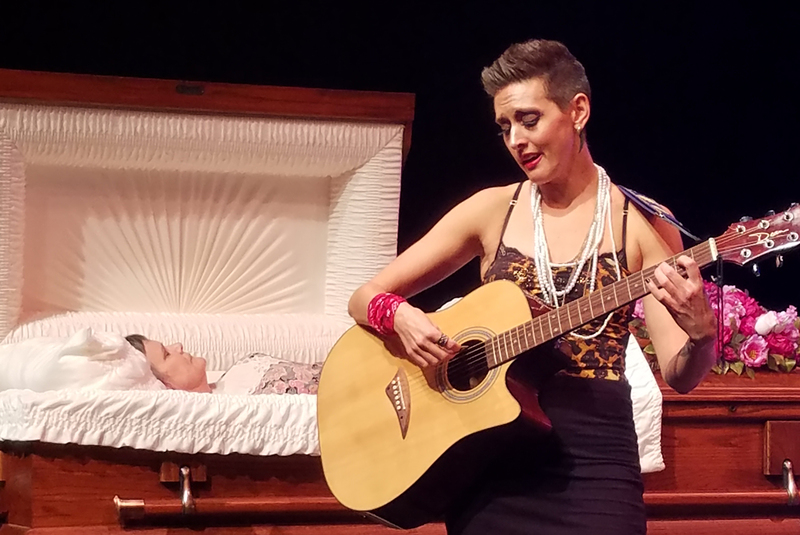 Emily Miller (in coffin) & Mandi Elkins Hutchins in Sordid Lives. Photo courtesy of Pandora Productions. Nostalgia is a curious thing. Books, movies, and plays can all be anchored into the memory with startling specificity. Del Shore’s Sordid Lives seems to occupy a special place in the heart of Bible belt audiences, the LGBTQ entry in the genre of Dixie-Fried comedy that flowered in the 1980’s and 90’s. The play is divided into four scenes that are framed by monologues from Ty Williamson (Jake Minton), a young actor who has been in therapy with 27 different therapists. Back in his hometown of Winters Texas, his grandmother, Peggy, has died tripping over the wooden legs of her lover, G.W. Nethercutt (Craig Nolan Highley). Yes, its that kind of plot. The incident has caused all sorts of conflict within the family, and resuscitated old and painful memories surrounding Peggy’s son Earl “Brother Boy” Williams (Shane Whitehead), who she committed to a mental institution 23 years earlier for being gay and a transvestite. The first scene centers on Peggy’s sister Sissy Hickey (a funny and mercurial turn by Rena Cherry Brown) receiving first Noletta Nethercutt (Jessica Tanselle), Peggy’s neighbor and G.W.’s wife, then Latrelle Williamson (Susan McNeese Lynch), another daughter and Ty’s mother, and finally, LaVonda Dupree (Glenna Godsey), the third and final daughter. Anchored by Ms. Brown’s solid work and excellent timing, this scene works well to establish the setting and characters and is well played by all four actors. The second scene takes place in a bar and involves Noletta and LaVonda holding up the male patrons at gunpoint as a means of exacting revenge on G.W., and the Owens brothers, Wardell (Mike Slaton) and Odell (John Auerlius), whose physical assault on “Brother Boy” had precipitated his institutionalization. Another character, the drunken Juanita (Jessica Sharpenstein) joins in on the fun but serves little other purpose in the story except comic relief. That scene, as written, is kind of a mess, and Jason Cooper’s well-chosen cast can only do so much with it. This is the third production of Sordid Lives I have seen in Louisville in the last eight seasons, and this scene is always problematic. Shore’s writing could use a good edit, and the episode runs on too long. Once again, the cast mines the turgid writing for solid laughs. Chapter three is the crucial element that I think explains the importance of the play. An extended therapy session between “Brother Boy” and the uptight Dr. Eve Bolinger (Kelsey Thompson) provides the opportunity for a scene-stealing performance, which Whitehead imbues with the requisite outrageousness delivered with sharp comic precision. If you drop the ball on this scene the play becomes nearly meaningless, but Whitehead does not disappoint. Ms. Thompson is so starchy and passive-aggressive as Dr. Bolinger she seems uncomfortable, a pent-up predator in too-tight wardrobe ready to pounce. By itself, this scene may be worth the ticket price. The over-long finale, in which all the characters come together, is Peggy’s funeral. There are a lot of laughs here, but the over-stuffed nature of Shore’s writing runs out of steam. 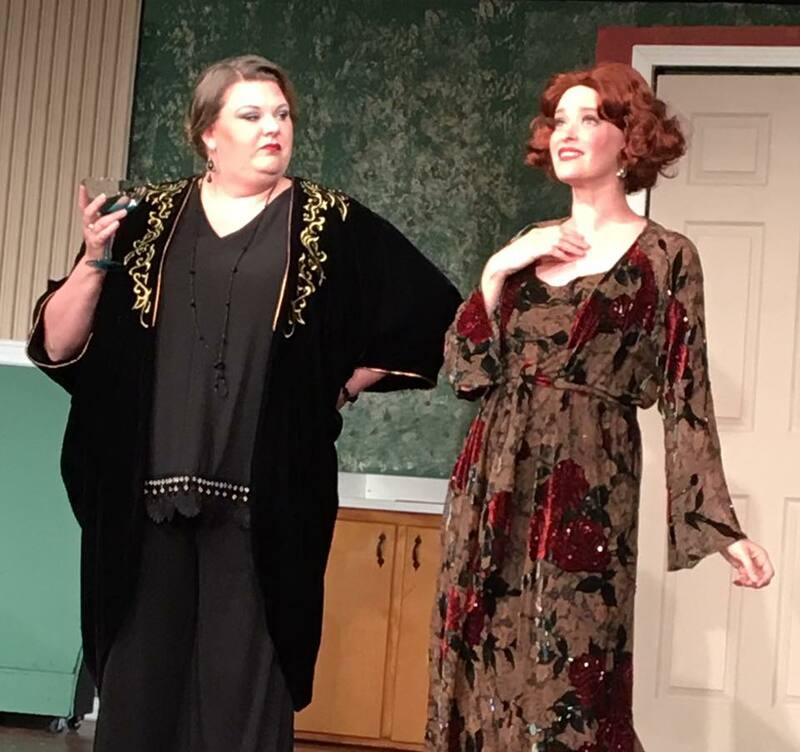 The play connects with the audience because it is about, as director Cooper recognizes in his program notes, “…love, acceptance, forgiveness, and the importance of family,” but its charms have always been a little lost on me. This may be the strongest production of Sordid Lives Louisville has yet seen, and the marvelous Mandi Elkins Hutchins is crucial to establishing the right tone with her delivery of a mix of Southern Baptist hymns and the title song, a country ballad fashioned after Brother Boy’s role models, Loretta Lynn and Tammy Wynette, yet I still wish it was tighter in the writing. It also feels more dated every time I see it, although the clash between gay and southern culture is certainly not without relevance in the current social climate. 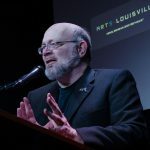 The fact that four of the cast have appeared in a production of this play a little over one year ago, two in the very same roles, speaks to the popularity, or even demand for this play by Louisville audiences, and the opening night crowd was welcoming. 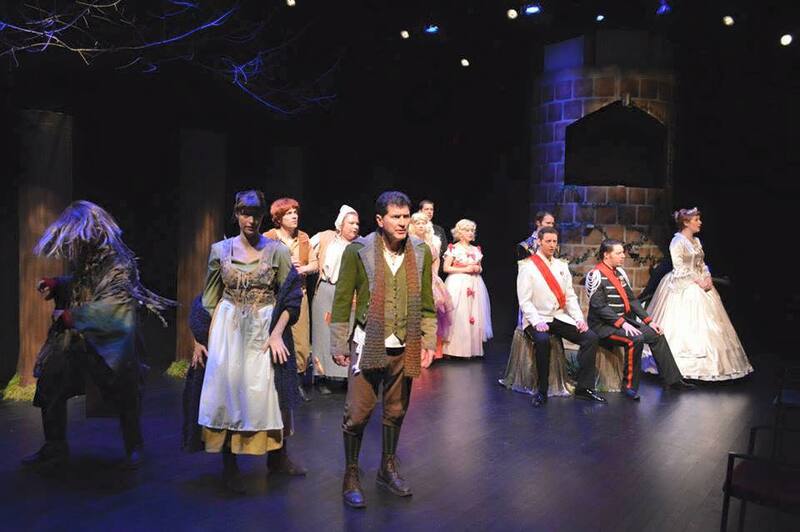 Whatever my reservations on the text, Cooper has fashioned a solid entertainment that utilizes to mostly good effect an ensemble of top-notch local talent. 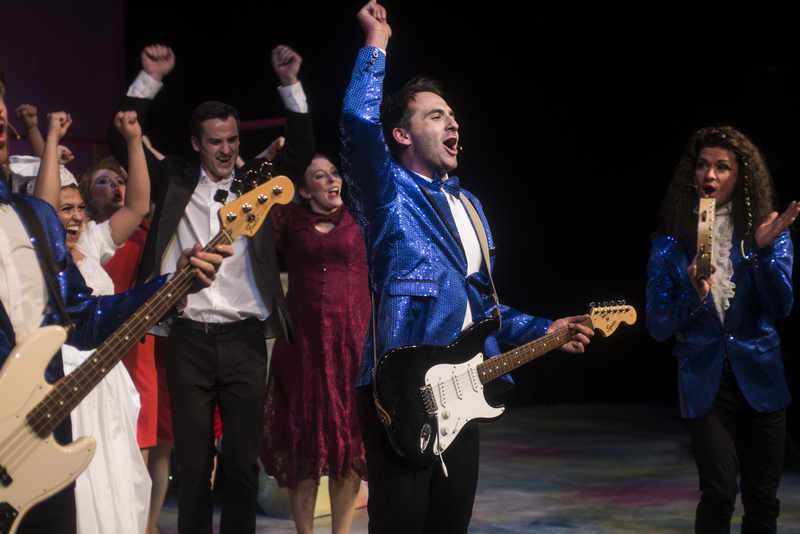 Sordid Lives opens the new Pandora season with an invitation to have fun. Thursday, September 14th @ 7:30 p.m.
Friday, September 15th @ 7:30 p.m.
Saturday, September 16th @ 7:30 p.m.
Sunday, September 17th @ 5:30 p.m.
Thursday, September 21st @ 7:30 p.m.
Friday, September 22nd @ 7:30 p.m.
Saturday, September 23rd @ 7:30 p.m.
Sunday, September 24th @ 2:00 p.m.
Tickets are $20 in advance / $22 day of show.